The unfortunate has happened. You believe your home is potentially infested with bed bugs. So what do you do? 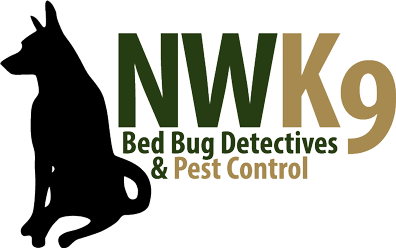 Call the trusted bed bug prevention team in Seattle at Northwest K9 Bed Bug Detectives. After you call us, we get to work implementing our proven five step process for bed bug inspections and elimination. What should you expect during the process? The first part of our process is inspection. During this inspection we use our #1 Inspector, Magic. Magic is a certified and highly trained bed bug detector. Using keen canine senses, Magic will alert us to the presence of any bed bugs in your home. After Magic performs an initial inspection, we will visually inspect the property to confirm Magic’s findings. Did you know K9 inspections are 97 percent accurate? After we have a handle on the situation, we begin our treatment process. This treatment usually occurs within 24 hours of our inspection process. After we have treated your home, our job is not over. We will follow up in two weeks with another inspection by Magic and a technician. We do this to ensure the problem has been thoroughly handled. Finally, we leave you with a bed bug prevention plan to help you guard against future infestations. This involves both actionable steps you can take and the implementation of key products. If you need bed bug prevention in Seattle, please contact our team right away. Did you know our bed bug inspector Magic can detect the presence of any level of infestation of bed bugs in your home? Using his incredible sense of smell, paired with unique training and certification, he can detect anything from a single live bed bug to a full blown infestation!